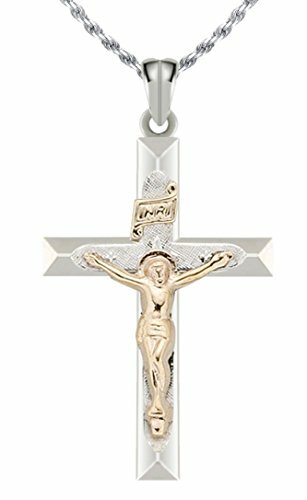 A brand new solid 0.925 sterling silver and 14k gold high polished crucifix cross pendant. A crucifix (from Latin cruci fixus meaning "(one) fixed to a cross") is an image of Jesus on the cross, as distinct from a bare cross. The representation of Jesus himself attached to the cross is referred to in English as the corpus (Latin for "body"). Makes a perfect gift for any occassion! We have a huge selection of solid gold or sterling silver jewelry including hundreds of pendants, rings, bracelets and earrings. MADE IN USA! SIZE AND MEASUREMENTS: Pendant is 32mm in length and 19mm in width. Size comparison - US Dime: 17mm, US Nickel: 21mm, US Quarter: 25mm. Take a look at the sizing image for more details.